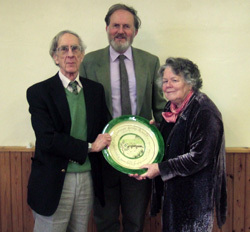 The Dartmoor Society 2012 Award was presented by Chairman Dr Tom Greeves to Michael and Swana Hardy at the Society’s 14th Annual General Meeting, held at Leusdon, Widecombe-in-the-Moor, on 14 April. At the presentation, Dr Greeves said, ‘Gidleigh Castle is an example of one of those historic gems which a traveller comes across unexpectedly in quiet corners of Britain. It is resonant with a long history stretching back to the Norman period and linking across northern Europe and Russia. Many generations have maintained the structure of the castle to a greater or lesser extent, but Michael and Swana Hardy, owners of the castle since 1983, have devoted much energy, emotion and resources to conserving and restoring the remaining fabric. 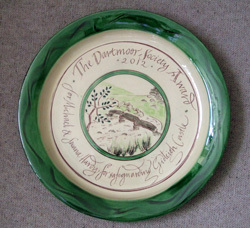 A visit by the Dartmoor Society in November 2009 enabled members to marvel at what had been done. The castle, in its partially ruined state, is now secure for the foreseeable future, thanks to Michael and Swana Hardy. The Society feels that ‘safeguarding’ is the most appropriate word to describe what they have achieved, as it has a ‘medieval’ ring to it. It gives me enormous pleasure to present this Award on behalf of the Society’.